Before you read any further, take a moment to pause and ask yourself this question... do you know how to listen? Yes, we know that you know how to pop in your earbuds and LISTEN to your favorite Spotify playlist. Yes, we know that you know how to take notes as you LISTEN to your boss rattling off upcoming project deadlines. And yes, we know that you know how to be present and LISTEN as your best friend shares about his/ her recent breakup. But all of these examples do not exactly get at the kind of "listening" we are asking about. We want you to ask yourself, do you know how to listen to the only voice that truly matters-- the voice of God. As we come together to explore and practice various forms of prayer and reflection as well as hear from young speakers from all walks of life, we will discover that we must attune our hearts to God in order to truly listen to His divine voice. Further, as we grow in our ability to listen, we are then able to discern, or recognize, God's will for our lives. 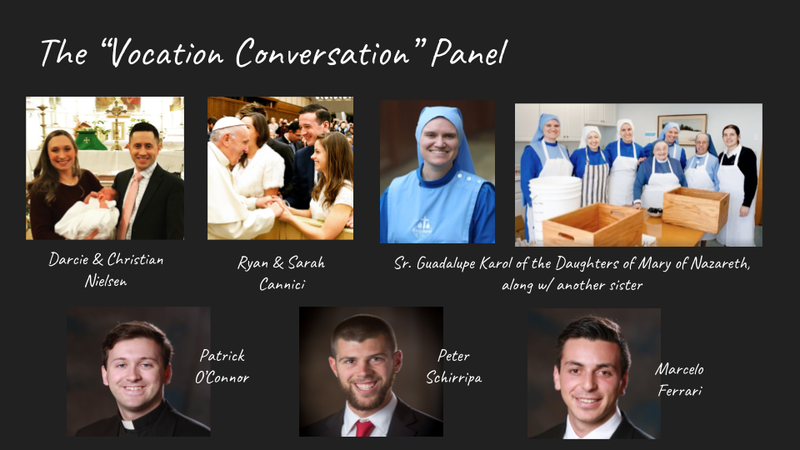 Ultimately, the purpose of this forum is to provide an opportunity for young people to deepen their understanding of what it means to fearlessly discern God's will. The following is the event's tentative schedule. Darcie and Christian Nielsen are parents to three beautiful daughters, all under the age of five. Beyond their responsibilities as husband & wife and father & mother, they are owners and principals of Spero, a consulting firm that works with Catholic ministries, parishes, dioceses, and schools. Ryan and Sarah Cannici met at Northeastern University in 2013 through their involvement with the Catholic Center. Through their years of dating and going to school together, Ryan and Sarah grew stronger and deeper in their love of Jesus, as well as one another. They have been married for just over three months and are very excited to see where the Lord leads them in their journey as husband and wife. Patrick O'Connor is a 3rd-year seminarian from Dedham, MA. He first felt God calling him to the priesthood while in 8th Grade, and started seminary formation after graduating from college. Peter Schirripa is in his second year of seminary. He grew up in Lexington, MA. Before attending the seminary, he went to Saint Anselm College and he also taught 6th grade English and Social Social Studies at Clarke Middle School in Lexington, MA. Marcelo Ferrari is a seminarian at St. John’s Seminary, studying for the Archdiocese of Boston. He attended Bentley University he enjoys writing, running, photography, soccer, poetry, hiking, reading, and a whole lot of coffee. Sister Guadalupe Karol Quinn is a sister of the Daughters of Mary of Nazareth. She studied Aerospace Engineering and worked as an Engineer for about four years before becoming a missionary with FOCUS (Fellowship of Catholic University Students) at Boston University. 1st Annual NCC Christmas Party!